My all-time favorite pie has always been Butterscotch Meringue Pie. My mom makes it for special occasions like Easter, Thanksgiving and Christmas and I always end up having at least two slices. There’s just something about the rich, smooth, sweet butterscotch filling that makes my tastebuds sing. If you haven’t yet tried a butterscotch pie, you are missing out! 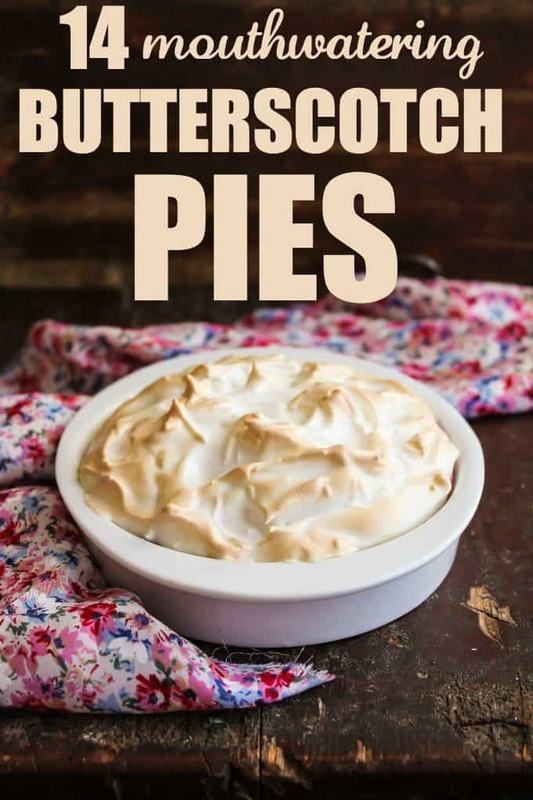 In honor of National Pi Day on March 14th, I’ve rounded up a Foodie.com collection of the very best Butterscotch Pie recipes. Yes, I know “Pi” is a mathematical term, but this special day has also crossed over into the culinary world and is celebrated with you guessed it….pies! Scroll through my collection of 14 varieties of butterscotch pies and you’ll find that there are many ways to enjoy this delightful dessert. I’m not sure which one I’ll try first. I could also try my hand at recreating my mom’s Butterscotch Meringue Pie. I have a similar recipe in the collection that looks amazing. Which recipe in my 14 Mouthwatering Butterscotch Pie collection are you looking forward to trying first? ooooh yes!! Butterscotch is one of my favourite pies! This is wonderful thank you! My daughter is a butterscotch fiend! I can’t wait to share these with her! Thanks! I have never tried butterscotch pie! I’m going to have to remedy this! One of my favorite pies is Butterscotch. My mom use to always make them. I have her recipe but don’t work out the same for me. My mom used to make the most divine butterscotch pie! I loved it but have rarely (as in once) seen it in a restaurant or grocery store. Thanks for the recipes! I’m eager to see which one tastes the most like my mom’s. I love butterscotch! Use chips in my fudge, yumm! Yes please, one of each! I have never tried butterscotch before, I think just to be on the safe side I should try it with something I’m familiar with, so I would try the Pumpkin Butterscotch Pie, thank you. I’m going to try the Mini Butterscotch pies!!! Butterscotch Meringue Pie sounds different yet delicious! I have never tried Butterscotch Pie but it looks and sounds delicious!! Thanks!! I am going to try the muffins. I am excited about the pumpkin butterscotch pie! Gahhh looks sooo good. I am officially never going to lose any weight! Super yum. Thanks for this. I seriously love desserts with Butterscotch. In college, my roommates mother brought us a dessert that she had in a 9 x 13. I still cannot find the recipe… it had a chocolate topping, and a peanut butter / butterscotch flavored middle. It possible coated oatmeal or rice crispies. I just remembered it being like heaven in my mouth. I have yet to try a pie with Butterscotch, sounds Yummy! I’m salivating just looking at these pics and recipes… May have to give one a shot this weekend. Thanks. Alright, I admit, I’ve never had butterscotch pie, but it sounds wonderful. I love butterscotch cookies and pudding so pie would be great too. I can’t decide whitch one to make first butterscotch and chocolate chip sounds really good. Thanks and enjoy yours! OMG I have not had anything butterscotch in years!! I was actually thinking about butterscotch ice cream yesterday. I would love to try making one of the butterscotch pies! My mouth is watering!!! Thanks for the great recipes, I will have to make one for my family this weekend! omg butterscotch pies! I’m drooling over here. Oh wow, it has been so long since I have had anything butterscotch. That must change. Mini Butterscotch cream pies are in my near future. I will have to make this for my son, he loves butterscotch ! Never really thought about a butterscotch pie. It is one of my favorite flavors and always eating butterscotch pudding. Need to try and make a pie! The butterscotch pie looks d-lish. I use the recipe that my grandmother used to make.